A single reel slice of heaven that's included in the Warner box, Big Band, Jazz, and Swing: Short Subject Collection (six discs). 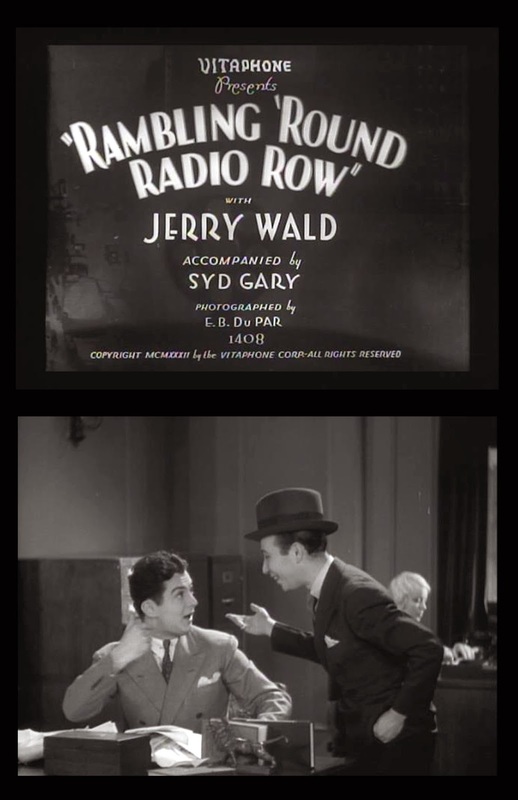 Jerry Wald as a harried promoter in Rambling Round Radio Row #1 was the same Wald who'd tote up unbroken success with the studios as writer/producer until death took him in 1962 at age 50. But for that untimely event, Wald's name might tower among ones who could spot good properties and guide them to high dollar finish. You could argue he was a most valuable man Warners had next to Wallis. 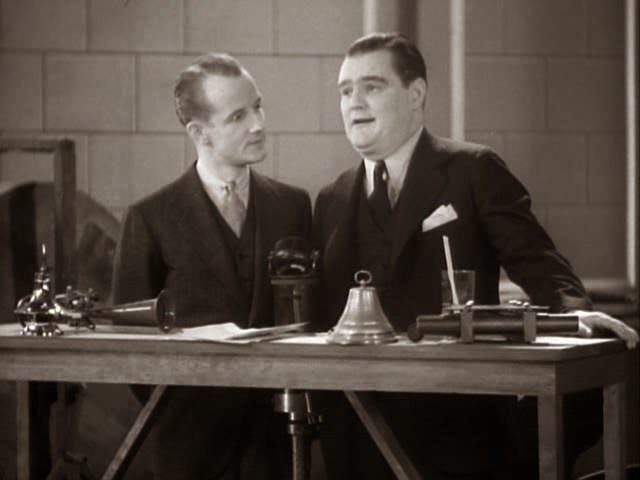 Wald began at radio reportage for a New York sheet and used contacts from that to take creative hold of broadcast-based shorts WB did from Gotham, the tyro playing himself and doing behind-scene work without credit. Rambling became a series to last several years, radio a warmest commodity thanks to viewer curiosity of what voices off the crystal set were like when not disembodied. Wald was chummy with talent and roped most before cameras, using a mock-up broadcast studio as backdrop. Such footage is priceless from OTR standpoint. Where else could we see Colonel Stoopnagle and Bud (above) pulling air shift replete with sound FX and ad-libbery? How accurate this reflected their daily bit might be debated, but toward capture of radio personalities in action, these Rambling shorts couldn't be bettered. 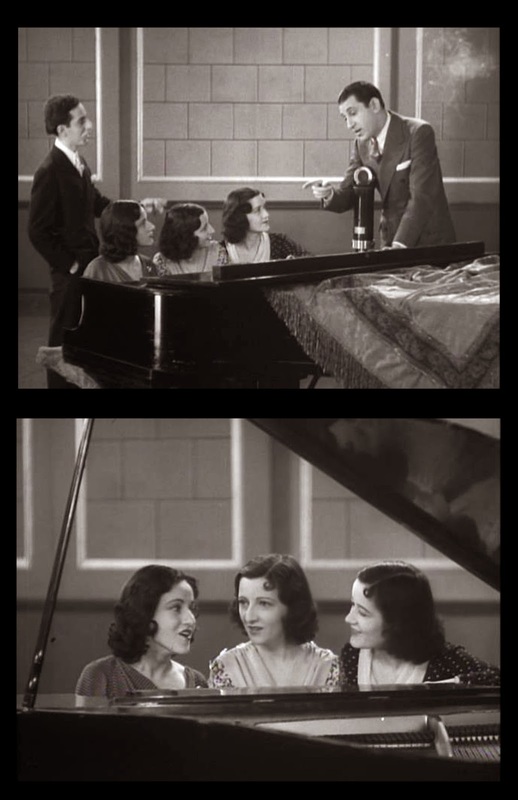 There's oddity of the Boswell Sisters (at right) harmonizing and kibitzer Abe Lyman stepping in to say they're lousy, him sans orchestra and us wondering why. Did Abe come too high with music accompany, or just pop in the Brooklyn studio that day for a walk-on? Further delight is Kate Smith in youthful blossom (her first screen appearance). She greets with trademark "Hello, Everybody!" and enters the room to sudden shift of the camera from head-on medium to shooting from below, emphasizing her girth in similar way John Huston would with Sydney Greenstreet in The Maltese Falcon. Jokes promptly revolve around Kate's weight --- guess that aspect came as revelation to viewers, unless they'd seen her at stage shows or read the fan mags. Based on energy she radiates here, KS looks like a safest bet for movie laurels, and indeed, she'd be starred by Paramount in a special-built vehicle called (what else?) Hello, Everybody, the following year. Demands had come in after her appearance in NIGHT AFTER NIGHT for a Mae West starring vehicle. Paramount played it safe and made HELLO, EVERBODY! with Kate Smith which should have been titled HELLO, ANYBODY? because nobody went to see it. Paramount sunk a fortune into it. The film tanked. Mae had Paramount by the short hairs as she was not under contract. Told it took three months to make a movie Mae said she could do it in three weeks. Paramount laughed. They had spent according to reports $2 million on HELLO, EVERYBODY. They gave Mae $150,000 for SHE DONE HIM WRONG (the movie title of her DIAMOND LIL which was condemned by the Hays Office). Mae West brought the picture in at $117,000.00 and in a lot less than the allotted three weeks. The picture was a huge hit. It and her second starring film, I'M NO ANGEL turned the tide for Paramount which had been about to sell its FAMOUS PLAYERS theater chain to MGM. Paramount killed the golden West goose by allowing the Legion of Decency to make her pictures safe for people who went to church on Sunday but never to the movies on Saturday night. Her last Paramount film, EVERY DAY'S A HOLIDAY had only one gag the Legion objected to. "Cut that gag and we will have a Mae West picture the whole family can see," said the smart guys in suits at Paramount. It tanked costing West her Paramount contract. They forgot that a Mae West picture the family could see was a Mae West picture her fans would not want to see.